(by Jeffry Bartash, MarketWatch) – The 2018 midterm election wasn’t a disaster for Donald Trump like it usually is for the president’s party: Republicans strengthened their control over the Senate even as they lost command of the House for the first time in eight years. Historically the party in the White House has lost badly in midterms…. The sitting president’s party has lost an average of 37 House seats since the end of World War Two. [During a lengthy] press conference on Wednesday, [President Trump asserted] the Republican gains in the Senate marked “a great victory,” noting how often the president’s party tends to suffer in midterm elections. It wasn’t enough to [prevent losing control] in the House, however. Republicans on Tuesday lost at least 27 House seats, with some results still pending. Democrats are projected to win around 33 seats. Still, it could have been worse. The losses suffered [by the Republicans] fit right in line with the norm — and they were just half the size of the defeats suffered by Barack Obama and Bill Clinton in their first term. Success in midterms is a rarity for anyone in the White House. 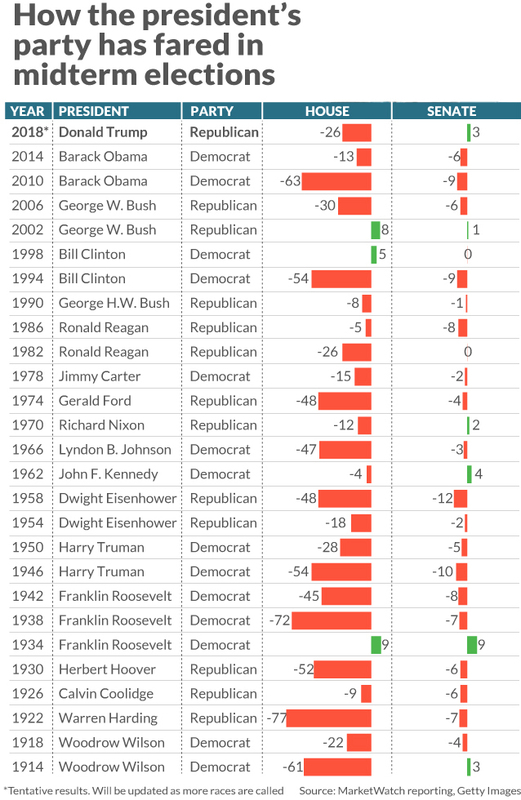 The president’s party has won seats in both the House and Senate just twice in the past century in a mid-term election: 2002 under George W. Bush and 1934 under Franklin D. Roosevelt. Republicans also appeared primed to hold on to a Senate seat in Arizona by the barest margins. The only Democratic pickup was in Nevada. A net gain of three seats will give Republicans a comfortable 54-46 margin in the Senate. Even in the House, the Democratic majority is projected to be narrow. [Republicans could now begin the new year with anywhere from 52 to 54 Senate seats, gaining between one and three seats, depending on how Arizona and Florida turn out. There is also a runoff election in Mississippi set to take place later this month, with that battle looking likely to end with a GOP victory. While Democrats, after winning control of the House, prepare for an onslaught of investigatory measures aimed at Trump and his administration, Republican reinforcements in the Senate will help their party there. Most prominently, more Republican senators will help the party and the president continue to push through conservative judges onto the federal bench. Should another Supreme Court vacancy arise before the 2020 elections, Republicans will have more votes to help them get a nominee through a grueling confirmation battle. 1. a) What is the significance of the Republicans winning seats in the Senate in the 2018 midterms? b) List the previous three times this occurred in the last 100 years. CHALLENGE: Name the president and party in these three elections. 2. a) How does the president’s party generally do in midterm elections? b) How many House seats did the Republicans lose in this midterm? 3. a) How does President Trump see the election? Why do you think a “blue wave” did not occur? 4. How do Republican losses in the House during President Trump’s midterm compare with midterm losses for Presidents Clinton and Obama? 5. Democrats won control of the House, which was expected in a midterm election. Republicans won more seats in the Senate, which was not expected until fairly recently. Do you think this is a positive or negative for each party? Explain your answers. 6. Major media news coverage of President Trump and Republican candidates has overall been much more negative than positive, whereas media coverage of Democratic candidates has been much more even-handed (and in the case of Democratic senatorial candidate Beto O’Rourke’s - 100% positive media coverage - as he ran against, but ultimately lost to, incumbent Republican Ted Cruz). What effect, if any, do you think biased media reporting had on the voters? For updated election results, go to c-span.